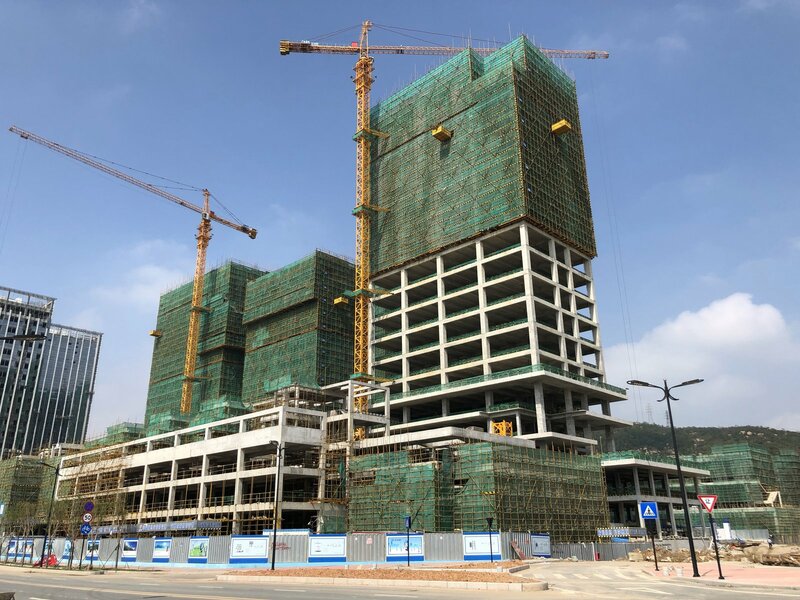 This mixed-use development is located in Zhuhai, China on Hengqin Island, on a waterfront property with views of the newly created man-made waterways that connect to the South China Sea. Recently, the world’s longest sea-crossing bridge opened connecting Zhuhai with Hong Kong; driving mass scale mixed-use development at an extremely fast rate. Due to this intensely competitive market, the client tasked GreenbergFarrow with developing a mixed-use project that would stand out among the rest. The design would need to draw newly residing residents, shoppers, and workers to a one of kind experience in order to compete with the surrounding developments. To do so, GreenbergFarrow developed various concepts in each of the programs represented on site: Residential, Retail, and Office. Tying these concepts together was an overall idea of live/work/shop that acted as the fundamental driver for our design and site layout. For part of the residential program, GreenbergFarrow tied together high-end condominiums with a retail shopping and restaurant experience. The podium-level waterfront condominiums have direct access to underground private parking spaces, private pools, water-view outdoor areas, and sit above a bustling retail and outdoor park environment; this retail programmatic component was highly considered to connect with an outdoor park experience. 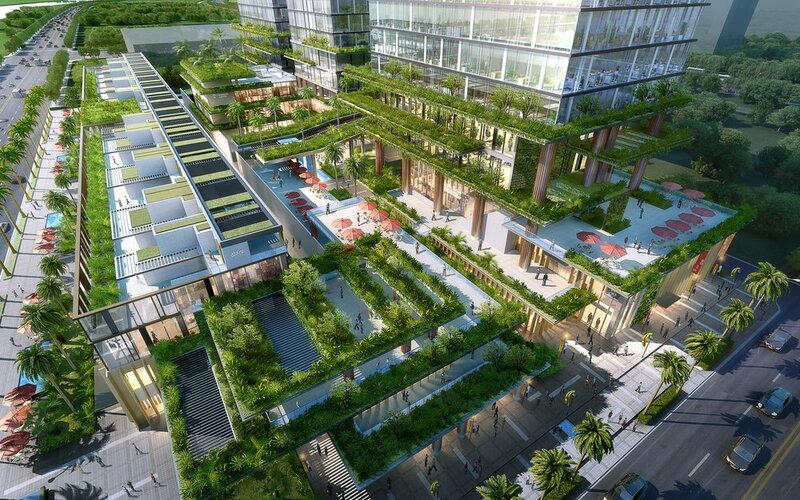 The office space was joined by introducing green, flowering overhangs throughout the lower office levels; this acts to connect the office users to the outdoors as well as creates a confined, beautiful green environment for the shoppers below. 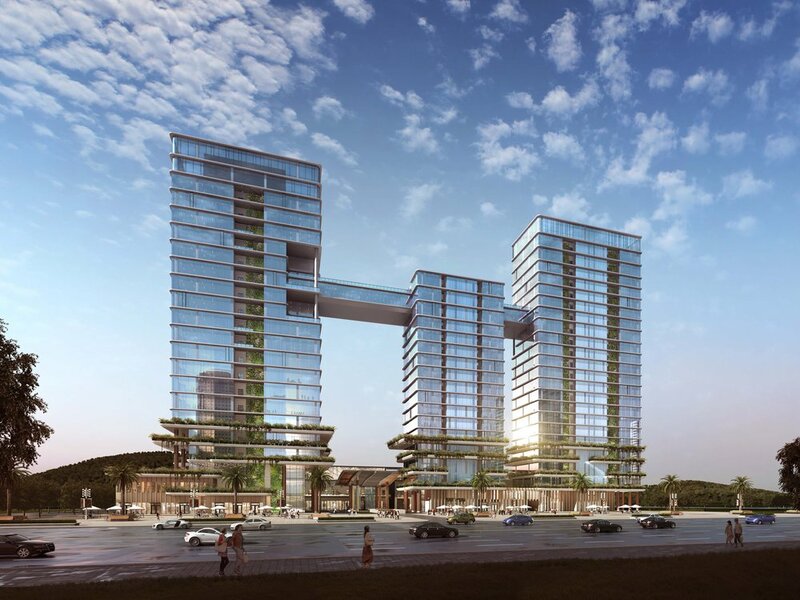 Furthermore, the office program is uniquely defined as GreenbergFarorw developed a live/work opportunity by introducing a massive sky-bridge that connects residential units with office spaces. The residential towers were chiefly considered. 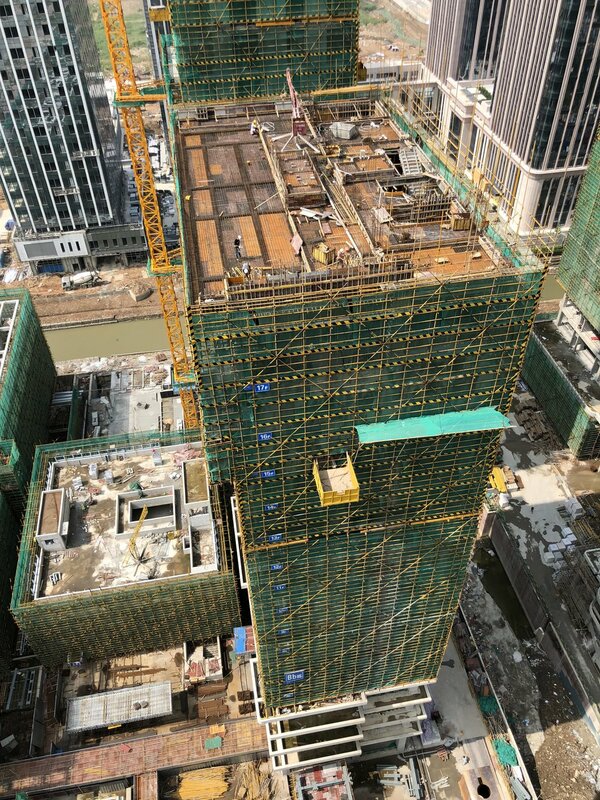 Within the two towers, each of the one-hundred and two units across 20 stories has a private outdoor deck equipped with outdoor pool and automated sliding glass walls. The glass walls will be one-of-a-kind when implemented as they were engineered specifically for this project. The floor to ceiling automated sliding walls is 4m tall and 2.5m wide; they are designed on tracks that, with the push of a button, expand the living room to an outdoor deck and private lounge pool. The challenge was developing a structure and plan that could consider every unit for each of the 20 stories. Above 10 stories the wind load and structural consideration for pools became a challenge, however, the end result is truly a beautiful and unique experience. The system developed will stand to separate this residential development from the surrounding competition and, more importantly, create a wonderful indoor/outdoor living experience for the residents to come. 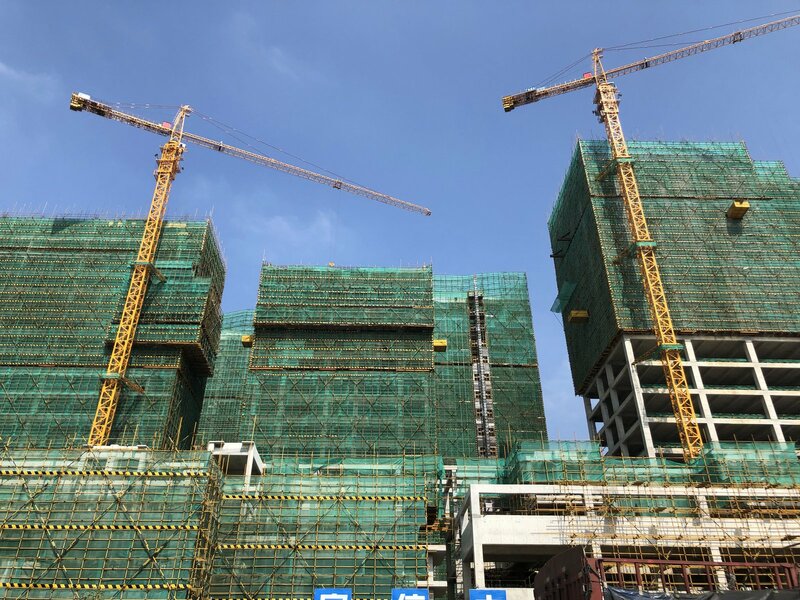 This Zhuhai-Hengqin development intrinsically connects all aspects of the required programmatic elements. 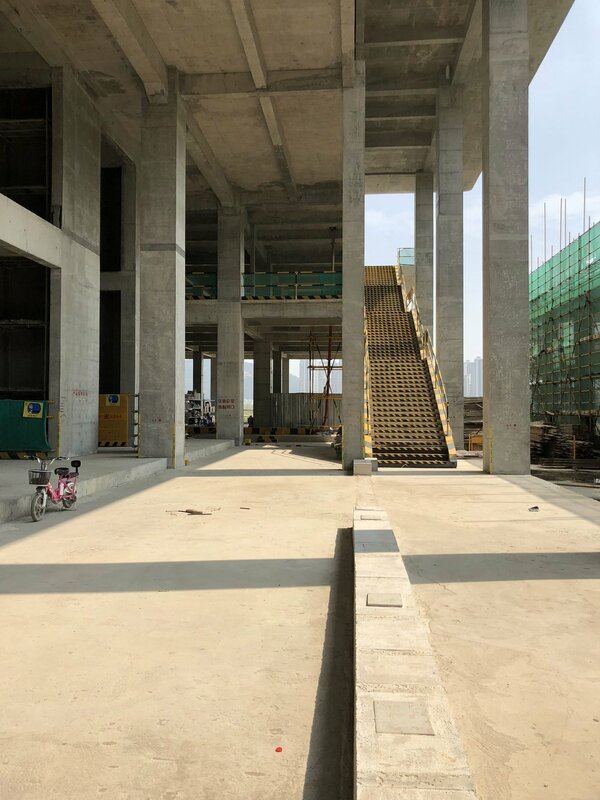 Through months of design-collaboration with our team and client, this project is set to become a destination on the island of Zhuhai.